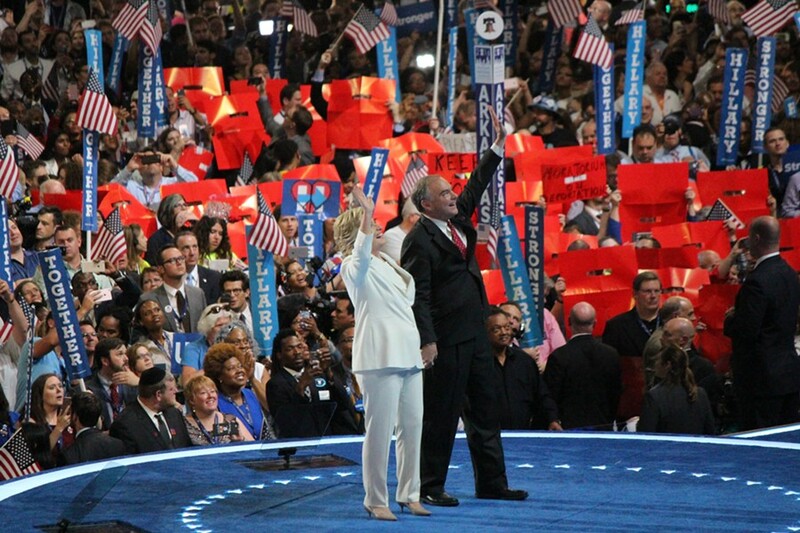 Hillary Clinton accepts the Democratic presidential nomination Thursday night in Philadelphia. On Tuesday night, Dottie Deans stood beside Sen. Bernie Sanders (I-Vt.) in the stands of the Wells Fargo Center and delivered most of Vermont's votes to her "beloved" presidential candidate. By Thursday night, the devoted Sanders supporter and Vermont Democratic Party chair was ready to embrace newly minted nominee Hillary Clinton. "Hallelujah!" 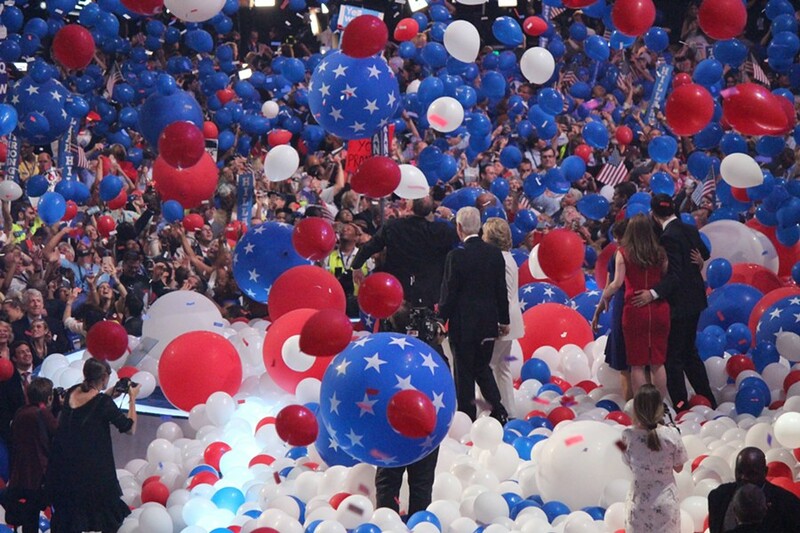 she shouted as red, white and blue balloons settled onstage, signaling the close of the Democratic National Convention. "This is a celebration. Hillary Rodham Clinton is awesome. [Vice presidential nominee] Tim Kaine was awesome. We've got something to fight for." 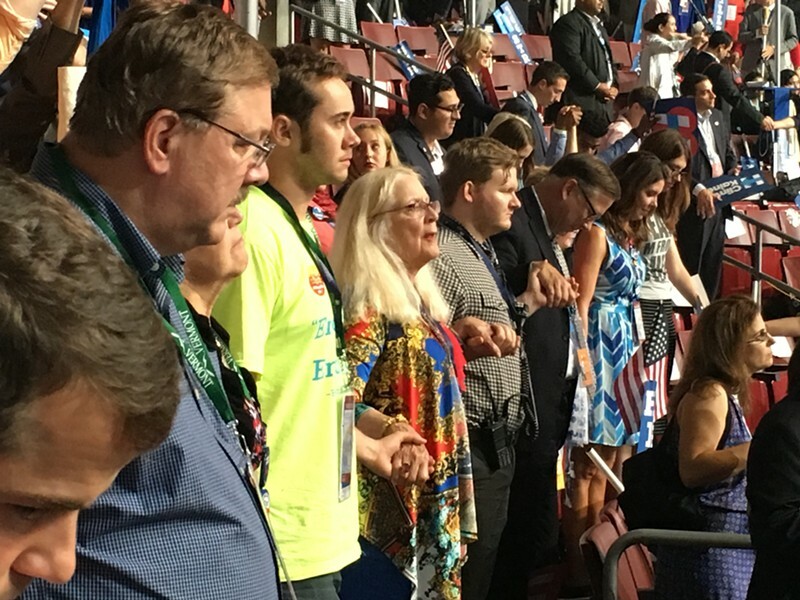 Vermont delegates hold hands Thursday night during the benediction at the Democratic National Convention in Philadelphia. In the Vermont section of the Philadelphia arena, Deans and her fellow delegates reacted to Clinton's coronation with what Burlington resident Brian Pine called "mixed emotions." Still mourning the end of the Sanders campaign, they expressed optimism that Clinton had learned from it — and would carry through on the progressive commitments she had made. Deans gestured to a young man standing one row away from her. "I'm very proud of this guy, Noah Detzer, who has been a Bernie [supporter]," she said, referring to the 25-year-old delegate from White River Junction. "He is still Bernie, so solid in his being. But he was present. He was here. He took it all in. And we are united." Unlike some Sanders devotees, who had fled Philadelphia in protest, Detzer had seen the convention through to its conclusion. Wearing a neon T-shirt bearing the Sanders slogan, "Enough is Enough," he said that his newfound friends in the Vermont delegation had helped him accept his candidate's defeat. "I'll tell you what: I don't necessarily buy into it 100 percent, but we do have a common enemy in that Donald Trump needs to be defeated," Detzer said, referring to the Republican nominee. The high school English teacher said he was pleased to hear "traces" of Sanders' message in Clinton's acceptance speech. "But," he added, "the thing is, her issue has always been following up very nice words with legitimate action." 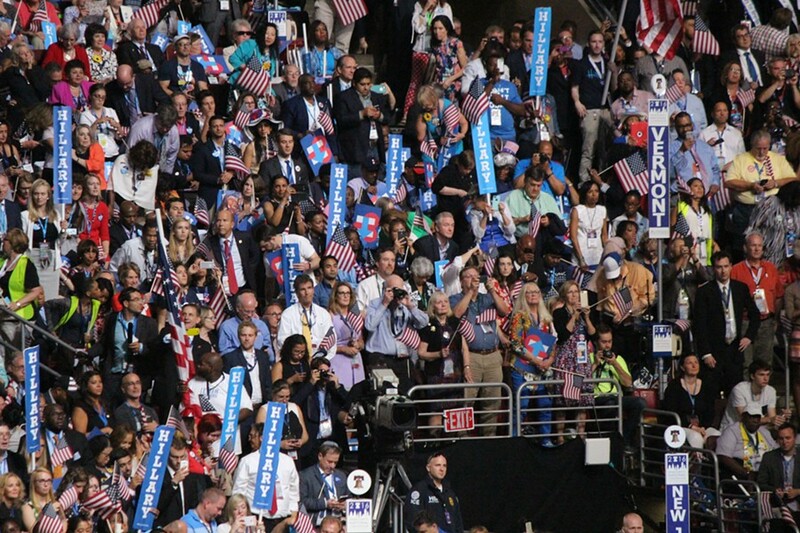 Vermont delegates watch Hillary Clinton accept the Democratic presidential nomination Thursday night in Philadelphia. Clinton twice mentioned Sanders during her hour-long address, drawing extended applause both times. "I want to thank Bernie Sanders," she said. "Bernie, your campaign inspired millions of Americans — particularly the young people who threw their hearts and souls into our primary. You put economic and social justice issues front and center, where they belong." Then Clinton addressed his loyal followers directly. "To all of your supporters, here and around the country, I want you to know I have heard you," she said. "Your cause is our cause. Our country needs your ideas, energy and passion. 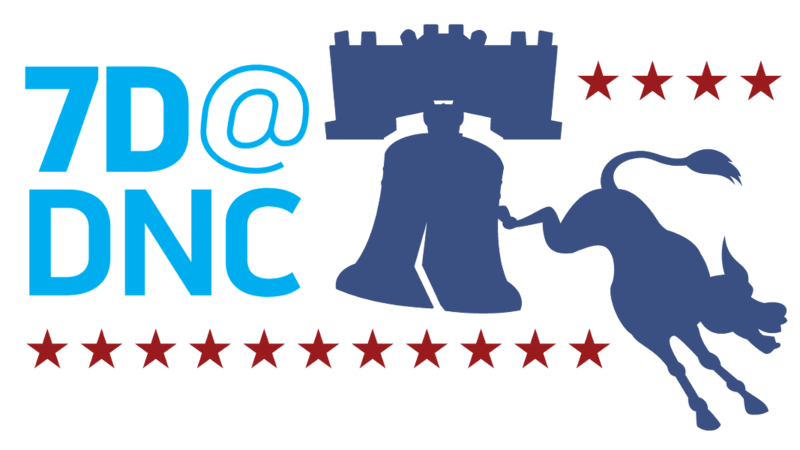 That is the only way we can turn our progressive platform into real change for America. We wrote it together. Now let's go out and make it happen together." Not every Sanders fan was convinced. 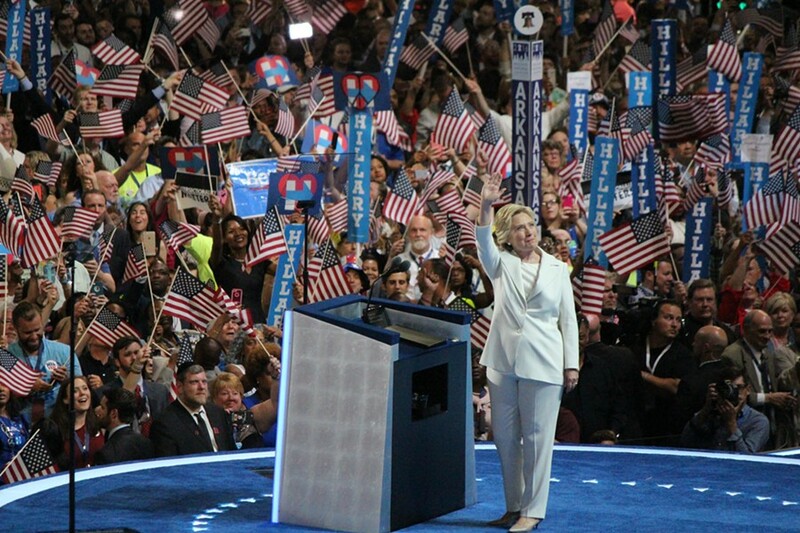 Throughout Clinton's speech, hecklers shouted and chanted, "No more war!" and other slogans. Each time, Clinton supporters responded by chanting, "Hillary!" in an effort to drown them out. In the Vermont section, Sanders supporters were more interested in listening than shouting. "On the economic justice issues Bernie has been articulating so well, I think she didn't just say them. I really think she's gonna stick with them," said Pine, who has known and supported Sanders for more than three decades. "I'm gonna give her the benefit of the doubt." Rep. Diane Lanpher (D-Vergennes), who also served as a Sanders delegate, said she was electrified by the evening's program. "This is the night that we get energized — the party gets energized to take it home," she said. "I think we're far more united tonight than we were the day we arrived. That's a good thing."